According to what can be found on the App Store support page for developers, the latest version of Apple's mobile operating system is currently installed on 56% of compatible devices. Over the past month, the adoption rate has increased 8% and that is an impressive result, I must say. In case you don't know, Apple made the eighth version of iOS available for users worldwide seven and a half weeks ago. 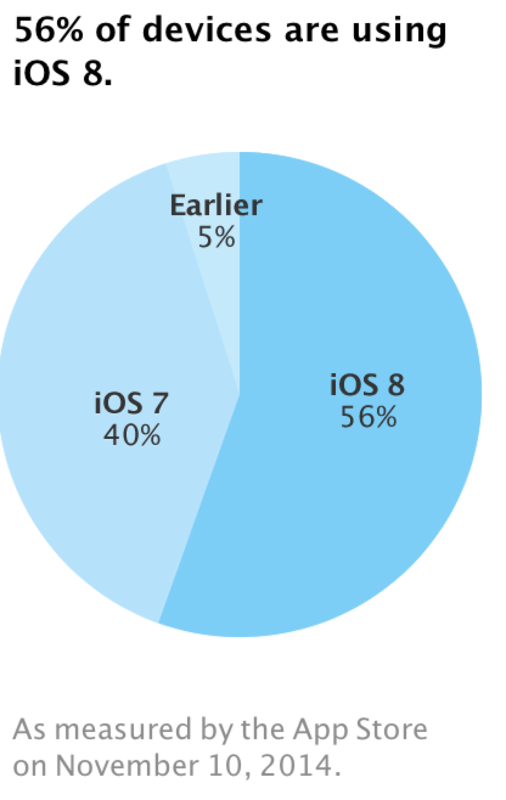 The noticeable increase in adoption rate took place after the official release of iOS 8.1 on October 20th. This version contained a wide number of bug fixes and new features like the support of Apple's recently-launched payments service called Apple Pay, Instant Hotspot, SMS Forwarding, beta access to iCloud Photo Library and the long-awaited return of the Camera Roll. During Apple's October 16 iPad event, Apple CEO Tim Cook said that iOS 8 was installed on 48 percent of devices as of October 13. 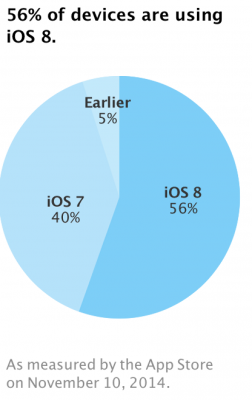 Before that, as of September 21, iOS 8 was installed on 46 percent of devices, indicating that adoption is steadily increasing after several weeks of stagnation. To be honest, it is rather strange that so many users upgraded to iOS 8, especially if to take into account the bug in HealthKit apps that made Apple pull them from the App Store, or the glitchy iOS 8.0.1 version that disabled Touch ID and cellular service on a wide number of iPhone 6 and iPhone 6 Plus units.